A dining adventure awaits you with a Northwest-inspired menu and fine wines in an intimate environment. Delight in fresh seafood, house cut steaks and pastas, followed by house made desserts any night of the week. Nightly specials are inspired and created by our chefs each day. After dinner, enjoy live entertainment in our lounge every evening. Our lounge offers fireside seating, a patio and serves lunch, dinner, local craft beers and cocktails. The Village Green is an enchanting Cottage Grove resort in a picturesque setting. Set amid the "Covered Bridge Capital of Oregon," this rustic, pet-friendly hotel provides an inviting blend of historic decor and contemporary conveniences, including a breathtaking 14-acre garden, restaurant, lounge, sparkling pool and hot tub. The resort also features charming, comfortable rooms, thoughtfully appointed with a welcoming range of amenities, along with meeting rooms, wedding facilities and friendly service from attentive staff. Dining room is terrible outdated and dark. Plastic table cloths don’t offer anything and the very dark lighting keeps it too dark. The food is very outdated with no flare to add to the experience. The whole experience took me back to the 70s. The Village Green has potential, but unfortunately the owners and management appear to have absolutely no vision. We stayed in a standard room which was in an older part of the hotel. The room did not smell fresh and needed updating badly. One part of the property was cordoned off because the roof of the covered outdoor parking had collapsed. Most of the property looked neglected. We had made reservations and were seated right away. Then we ordered our meals and chose the wine. Our bottle of wine arrived, the friendly waitress poured our glasses and shortly after that our meals arrived. 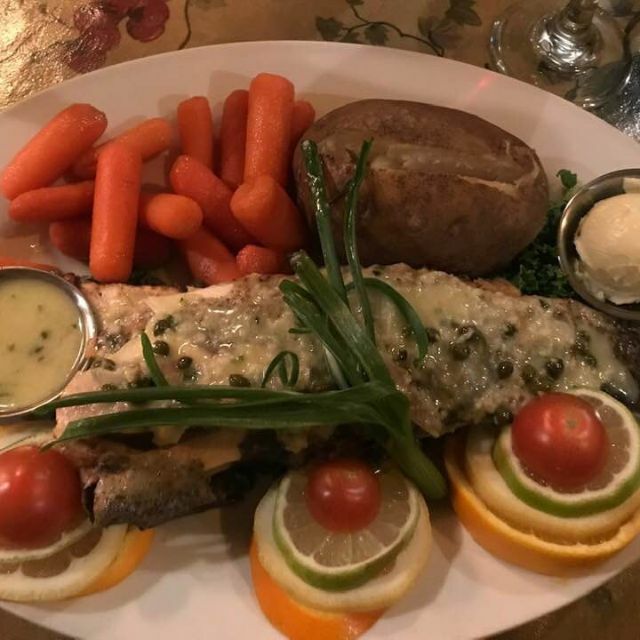 I had ordered the crab-stuffed trout and my husband ordered the 12 oz steak. Both meals were very good but we could not eat it all because the portions were very generous. If I were to dine there again, I would skip lunch that day. I would recommend this restaurant to my friends. willing to accommodate special requests, as in "No sauce on the meat, please. On the side." Huge portions! Enough for 2 meals. The Seasons at the Village Green was a very average experience. The food and wine was acceptable but not outstanding in any way. The service was also unremarkable. My husband and I will not return. Seated right away with our reservation. Wine and bread were brought to our table right away with salads following soon after. Then we waited, and waited. Finally after about 40 minutes, another waitress other than ours came to ask how our meal was....we hadn't eaten our entree yet, our waitress forgot to put our order into the kitchen. Our entree appeared about 20 min later. The food was delicious but not sure worth the wait. A complimentary dessert was sent to our table, which we took home as we were too full to eat it then. Staff was polite but not sure how this could happen. Great meal, outstanding food, quiet seating. Good wine with great presentation. Would go back as often as possible. Value was a key. Great ambiance but needs some background music to drown out conversations. Service was great! our steaks had a lot of gristle so that was a little disappointing. One side of booth barely allowed even my wife to squeeze in. I couldnt. Hope thats not true with every booth. Never had that problem anywhere. i would still recommend it! The dining area was nicely decorated and quiet. Our servers were knowledgeable, friendly and helpful. 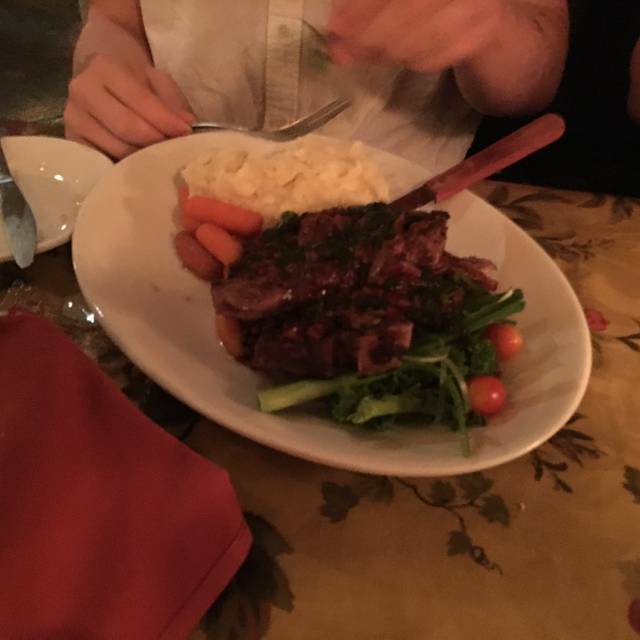 Our meals (Tri tip and Shrimp risotto) were outstanding, large portions and very delicious. We stayed at the Village Green resort recently which included dinner in the restaurant. Our dinner was very good with a lovely presentation and good service. It was very quiet the night we were there and our only complaint was there was no music playing in the background so made it a bit uncomfortable to talk as you felt everyone could listen. The place could use a little ambiance and soft music would help. Great food and service, but for the ambience I would suggest some background music to set the mood. Our waitress took our order them disappeared. We waited an hour for our food. The baked potatoe tasted old. We couldn’t ea it. Had a very special Valentines date with the wife. Village Green made it wonderful, and the dinner was great as well. Thanks for making this date memorable! We just had a wonderful After-Valentine's Day dinner date at the Village Green. The food was great, as was the service. We sat in a wonderful corner booth - the only drawback of which was a view of the kitchen entrance. It was a lovely time - Thanks Everyone! We were a party of 4, made reservations ahead of time- restaurant was maybe half full and we were seated at a table by the kitchen door! With many tables open. We did ask to move to another table after our drinks arrived, and they did move us. The decor looks as if they couldn’t decide what they wanted for the “theme” of this restaurant so they just did an unsuccessful mash up of “Italian”, maybe grandmas kitchen in 1940... dark and dingy. The food was “ok”. Not terrible, not great. Overpriced for the quality of what was served. Almost as if the manager did not really know the basics of running a successful, welcoming, dining experience focused restaurant. Not even thinking about the staff needing to yell “door” so that all might know to step back out of the way of the door. Or maybe put up strategically placed mirrors-something to stop the staff crashing into one another. The Village Green has been a special place for so many for decades, and it’s just such a disappointment to have our first experience be so Lee’s than average. We are so hoping someone might take it in hand and make it great! It’s a real opportunity waiting for someone to make a lovely dining experience in Cottage Grove. Maybe start by removing the old, plastic tablecloths? Made reservations online, that went smoothly. Seated quickly, even though they were very busy. Service was fairly quick. I ordered the trout stuffed with crab and was disappointed. There were more capers than crab stuffed inside the trout. I had to rake them out there were so many. Bread was warm, salad was good, veggies were fair as I didn't want any potatoes. Corkage of 10$ was fair, I live local and will be back, just wont order the trout. Staff needed to work on more prompt service. Hostess delays in seating people for reservations slower than expected waiting time. The server was fabulous! Attentive but not overbearing! The dinner was good, although not hot but okay to eat and not to complain. Our friend had shrimp and she said it was flavorful, but cold. She opted not to complain. Very nice pre-Christmas dinner with friends. Creative menu. Understaffed and overworked. It took over an hour to receive our entree. Give yourself at least 2 hours to eat here. I ordered the Chicken Marsala, was not given a choice of a side dish, it came out with rice. It was covered in a terrible version of a Marsala sauce and it was burnt on the outside, but on the inside the chicken was very tender and flavorful. The rice was under cooked and the veggies were bland steamed baby carrots. Bread was good, not sure what the butter was because it had no flavor at all. Husband had the steak, he said it was pretty good. The noise was very loud we felt like we were eating in a cafeteria. There could have been more choices on the buffet such as salads...perhaps they should charge a bit more and offer more selection. The service was very good however. All in all it was not what we expected for a major holiday meal. We will not be back unless they step it up a notch. The service was excellent. The portions were great. The steak although ordered medium rare was cooked medium. The Pinot Noir was fair in quality. I would recommend dining here if in the area. What a very pleasant surprise! Great meal, great atmosphere, great service. We left there smiling!!! My mom & husband brought me there for my birthday. The atmosphere and decor was very pleasing . The menu was short but was wonderfully delicious! And after our meal I got to pick out a desert for my birthday . Made it very special and to the family members that bought me. Thank you! We had an excellent meal in a quiet, romantic restaurant. Service was very good, the price reasonable, and the food delicious. We will be back. Part of an older hotel property that has been undergoing refurbishment. The restaurant appearance is somewhat dated, but the food was very good and the service was attentive without being intrusive. Quiet enough to carry on a conversation with having to raise one's voice, which is a nice change from many places I've been lately. Three of us had the salmon dinner and the fish was done just right. What a great time!! 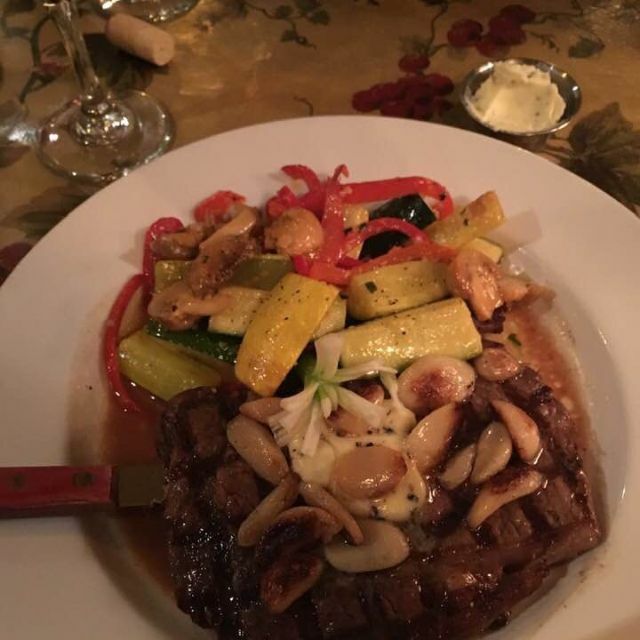 Fantastic food, excellent personal service, pleasant dining environment, reasonable prices and I had a terrific walk in the garden after dinner and enjoyed a great live guitar performance in the lounge. I recommend it highly and look forward to returning soon. The food was good but I feel was over priced if we had not had it included in our New Years package. The food was good but basic and thus not a place we would go just for dinner if we hadn't had it in a package. The staff seemed new and overwhelmed, perhaps over booked for New Years Eve dinner but the staff was always nice. I would consider either lowering prices or changing the menu a bit to have the quality up to the high price. Also I would train the staff longer before having such a big event. The food was awesome! Price very reasonable for what one receives. We went for Christmas dinner so we were a bit bummed that all the outside lights were off after we finished eating. It was like "oh, Christmas must be over now." 😢 All in all though, it was a delightful Christmas dinner for all of us! Very nice dinner will come back. Wish the christmas lights in the garden was open. Would have spent some time in the garden. Really good food - great specials. We had our Christmas Eve Dinner here and it will now be our new family tradition. Quiet but festive . Great wine list, good menu choices. Very good service. 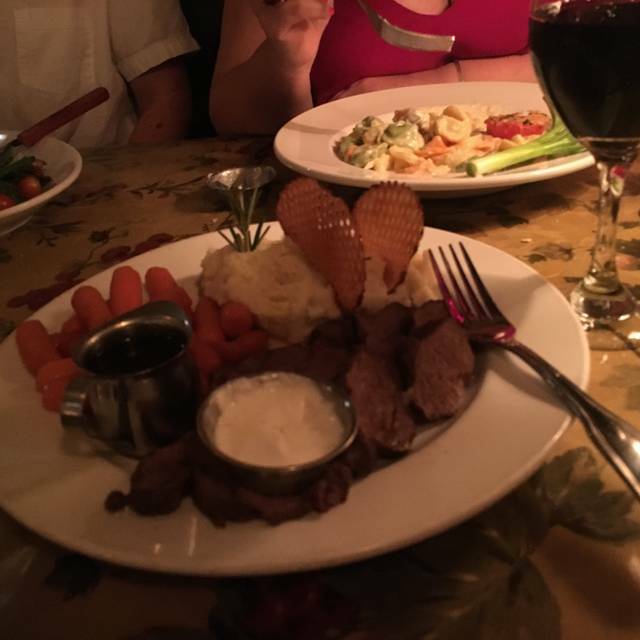 We have gone for dinner at other times and the food is always great! My wife has stage four cancer and thinking this is our last xmas together I wanted something nice for her. Her meal was burnt so bad she couldn't eat it. I sent it back but she was forgotten. Our meal was comped but I can't get xmas eve back. She left in tears and I left with a broken heart. Reservation but had to add table settings. Cold air at our back asked for heat, told by waiter that he was hot! Food cold including soup, lasagna. Asked for lightly cooked salmon but it was chared on the bottom. And on and on! Would never recommend but would tell our experience. We had been think about trying Seasons at the Green for years. I can't say I was impressed The potatoes, both mashed and baked, looked and tasted like the were from the previous day. Mash potatoes we flavorless and lumpy. The baked potatoes did not taste fresh. Our reservations were for 5:00 PM, dinner opening time. I would expect all food to be recently prepared. We had invited two other guess to join us for dinner. Fortunately they couldn't make it. Not a good dinning experience. We voice our concerns to the manager on duty. She didn't seem to be very surprised by our comments. The wait staff was friendly and efficient. The food was very tasty. I enjoyed my visit very much.